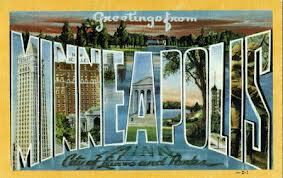 My friend Sandy just posted a link to a blog by writer Allison Green about a trip Sandy and I took 20 years ago to Minneapolis. We headed there to visit Allison for Thanksgiving weekend, but the Minneapolis trip also would serve as a pilgrimage to the TV home of the Mary Tyler Moore show. I’ve reposted Allison’s blog below, about the “tour” she created for Sandy, and which I was honored to attend as well–a true accomplishment since the show was actually filmed in Los Angeles–but wanted to add my two cents since it is still a vivid memory. It was the fall of ’92 and we drove there from Lincoln, Nebraska, with a brief stop in Elk Point, South Dakota where we ate a late lunch in a bar that also served as the local bank–it was empty when we showed up and packed by the time we left with people cashing their paychecks and getting an early start on celebrating their long Thanksgiving holiday. The perfect way to begin our own weekend. 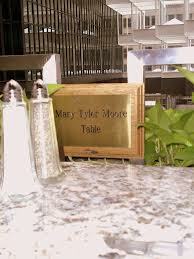 This might be hard to see, but it is, indeed, the commemorative brass plaque at the “Mary Tyler Moore” table in Minneapolis! It’s hard to believe we were there only a weekend. And that was before we went on the tour. 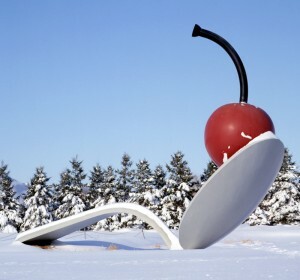 Allison had to work to find all the landmarks from the show–most of the Minneapolis shots are from the 30 seconds of opening credits–but we hit every spot there was–finishing in a shopping mall in Minneapolis where we had dinner at the “Mary Tyler Moore” table. And while the restaurant usually didn’t take reservations, Allison, with her creative skills, talked them into allowing us to eat there. I still have a crayon rubbing I made of the brass plaque at the table, and I still have memories of that visit though I haven’t been back to Minneapolis since. I suppose it seems silly now that Sandy and Allison and I were a little obsessed with the Mary Tyler Moore Show, but there weren’t so many shows way back in the ’70s about girls living on their own, independently. There was Mary Tyler Moore and That Girl and there was Laverne and Shirley, and let’s face it, Mary had the better job by far. . . . How important was it for Allison to remind us that girls could make it on their own? Hey, Kate! When I pulled out the pictures to remind myself of what we did that weekend, I tracked down your blog and enjoyed seeing what you’ve been up to. I had forgotten that we went to Mickey’s and the Timberwolves. And, yes, I think Sandy was best friend to a lot of people. So great to reconnect with you after all these years.